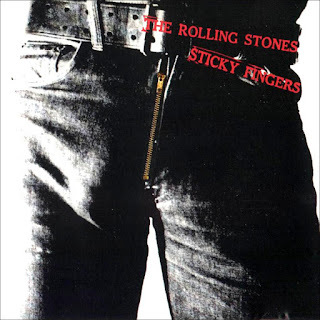 "Sticky Fingers" is the ninth British and eleventh American studio album,released in April 1971. The album was the first of the "Rolling Stones" albums to make #1 on both sides of the Atlantic and in many other countries around the globe. It was a long time in the recording, as was alluded to on the cover – ‘and everyone else who has had the patience to sit thru this for two million hours. It's a weary, drug-laden album (well over half the songs explicitly mention drug use, while the others merely allude to it) that never fades away, but it barely keeps afloat. It is the band's first album of the 1970s and its first release on the band's newly-formed label, Rolling Stones Records, after having been contracted since 1963 with Decca Records in the UK and London Records in the US. It is also Mick Taylor's first full-length appearance on a "Rolling Stones" album, and the first not to feature any contributions from founding guitarist Brian Jones. In 2003, "Sticky Fingers" was listed as #63 on Rolling Stone magazine's 500 Greatest Albums of All Time.